It was a tremendous attraction, a sort of paradise found in which I was completeley free, alone, at peace. Last night’s excursion to the Dallas Museum of Art left me weary enough to tumble into bed well ahead of my habitual time. The surprise was waking around 4:30 this morning, rested, and unable to get back to sleep. By 6:00, I had found sanctuary in the rear of my darkened classroom, and chose to devote some quality time re-reading the second volume of Hilary Spurling’s biography Matisse the Master. Most of the volume covers his exotic travels to Ajaccio, Collioure, Tangier, Nice, Tahiti and Vence, drawing superb parallels between his artistic explorations and those of Delacroix and Gauguin. The more I read, the more I thought about that sanctuary sentiment, that within each of us is a stillness and sanctuary to where we can retreat at any time and be ourself (I read that on a school poster when I was in junior high school, and still remember the words and image). I found myself deeply gratified, having a good ninety minutes of alone time before the students entered the classroom. 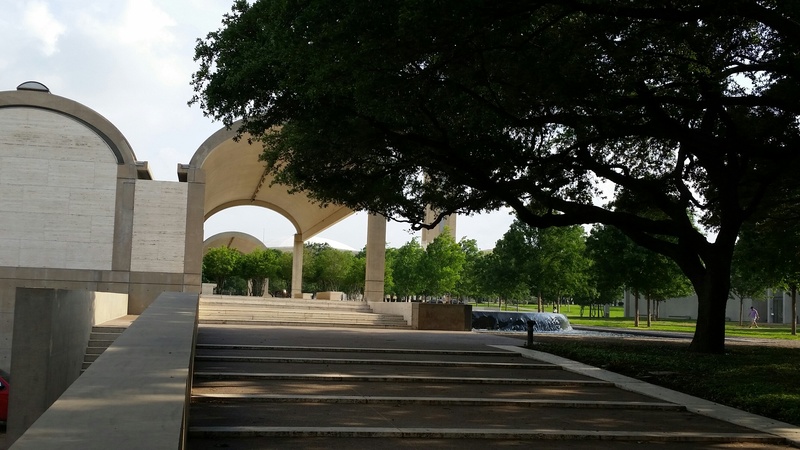 The Kimbell Art Museum has extended hours on Friday, so I chose to journey there after school today and stay until closing tonight. The hours were refreshing, as I perused the galleries in the Kahn Building and the Piano Pavilion, and sat in several locations to read from a lovely birthday book given to me by a dear friend: Paintings in Proust: A Visual Companion to “In Search of Lost Time”. I was already in love with this author’s magnum opus, and could tell that he was alluding to artistic masterpieces, but this book takes the discussions much deeper than my imagination had been capable of pursuing. I got lost in the volume, and the time evaporated quickly this evening. 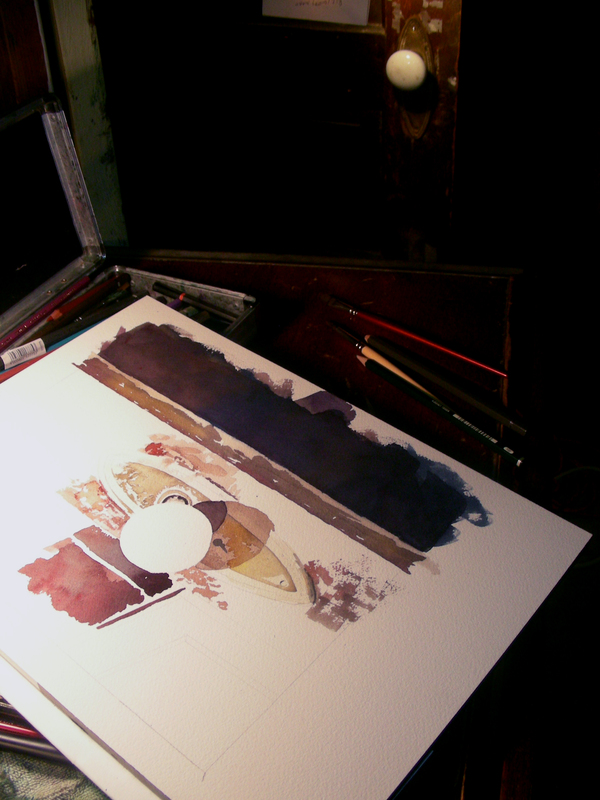 Before leaving home for the Kimbell, I spent some more time on this watercolor that’s been developing slowly. I worked on the power plant to the right quite a bit more, and placed trees below it, then moved to the scraggly tree on the left side of the caboose and worked further on the branches. 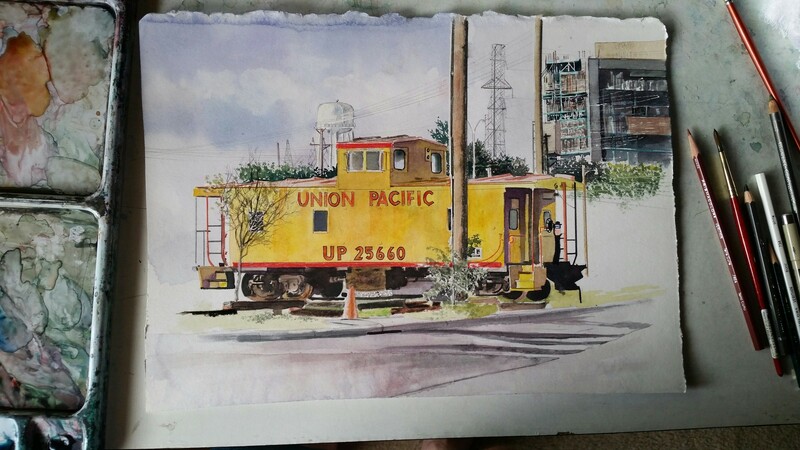 I’m always tweaking the caboose itself, enriching colors, drafting linear details, and refining the window tints as well as the trucks underneath. The foreground pavement also got some attention. I don’t think there should be too much left to do on this one. I’m ready to bring it to a close, but I’m too sleepy to work any further on it tonight. The museum tour and reading took quite a toll on me physically. My college students are wrapping up their online final exam, and the semester there is coming to a close. Today also I saw the notice that progress reports for high school are due Monday. Charming. More after hours and weekend school work. What a surprise awaited me when I opened the blinds to my living room Saturday morning and looked out into my back yard. 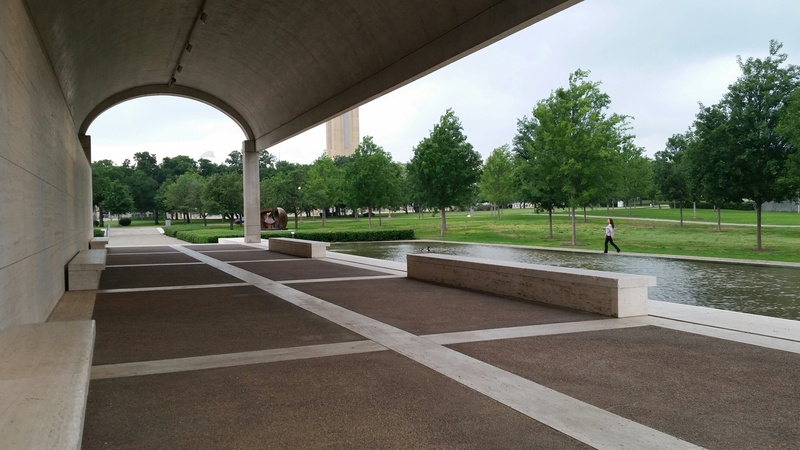 The night before, I was at the Kimbell Art Museum, and they rushed us underground to avoid a tornado threat. I got home well after dark and didn’t think of checking my back yard, totally unaware of what was lying there to greet me the next morning. Crap. 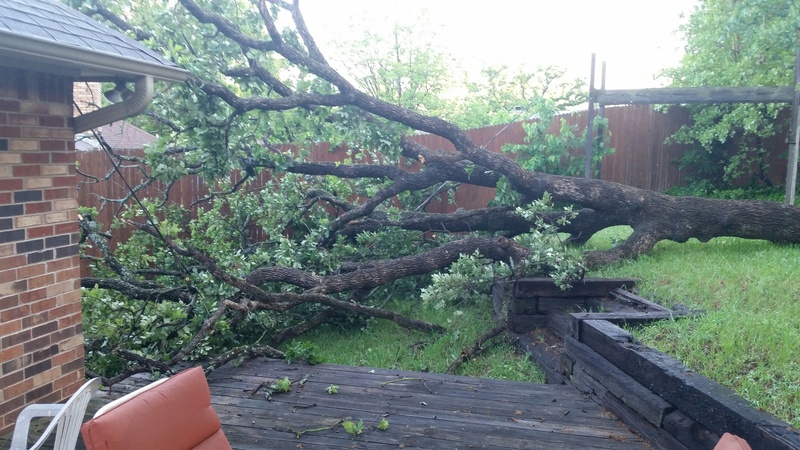 I called TXU to tell them there was a powerline underneath the tree. They wanted to know if I lost power? No. Were there sparks flying? No.Then they would get there when they could. Not yesterday, and not today either, apparently. So meanwhile, I get to look out at this titanic corpse of a tree that fills my entire back yard until they deal with the power line. Then I get to hire a crew to cut it up and haul it out. Choosing to stay home the entire day, JUST IN CASE THEY CAME, I began reclaiming the rooms of my house that were set in disarray from my hauling out art work and furniture for last week’s festival. I don’t know how I manage this, but I trash out my house every time I get ready for an art festival, with all the matting, shrinkwrapping, packaging, packing and loading. 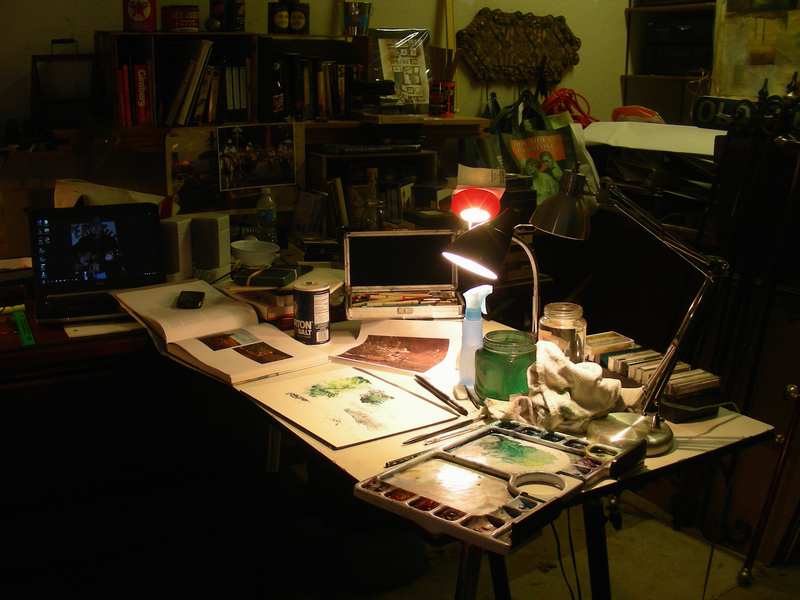 Then when I return, everything just gets dumped back into the rooms, and I usually walk around it for a week before I get so sick of seeing it that I finally set to work tidying, and reclaiming my special work spaces. Most of my art work is stored in the room I like to call my Motherwell Room. Robert Motherwell’s blend of artistic prowess with scholarly erudition has always had ways of motivating me to learn more, to be more. 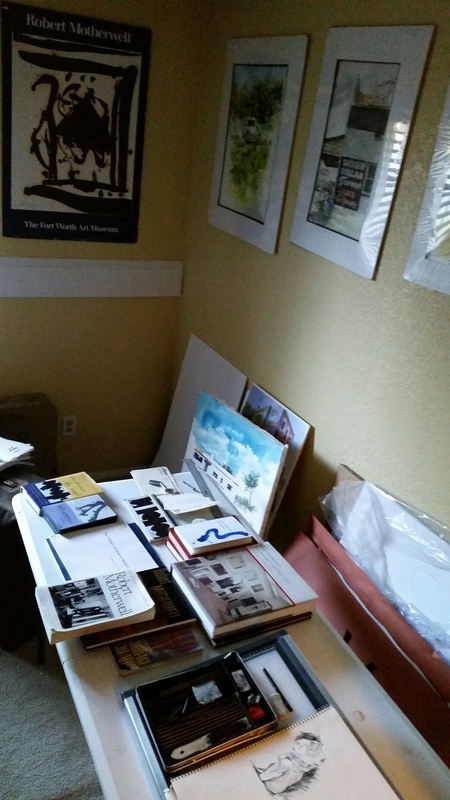 Thus, I have this room set up with all my Motherwell books, as well as a table for making art, and most of my unhanged art work arranged around the walls and stored in the walk-in closet. 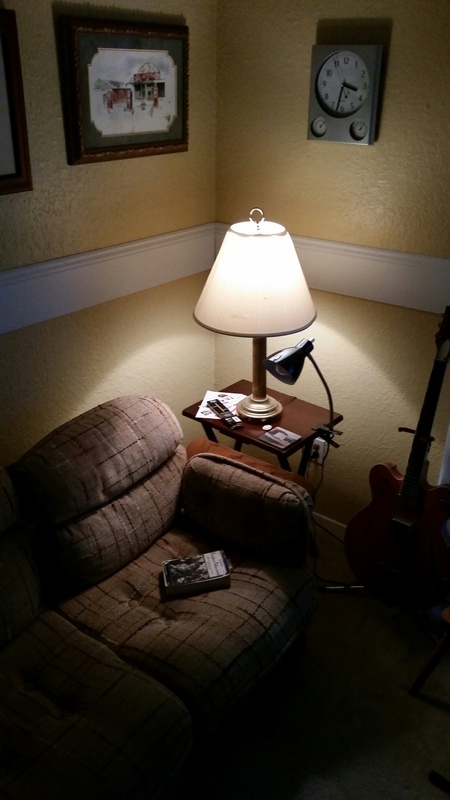 I also reserve a corner of that room for my special reading. Saturday was given to a day of reading and painting. 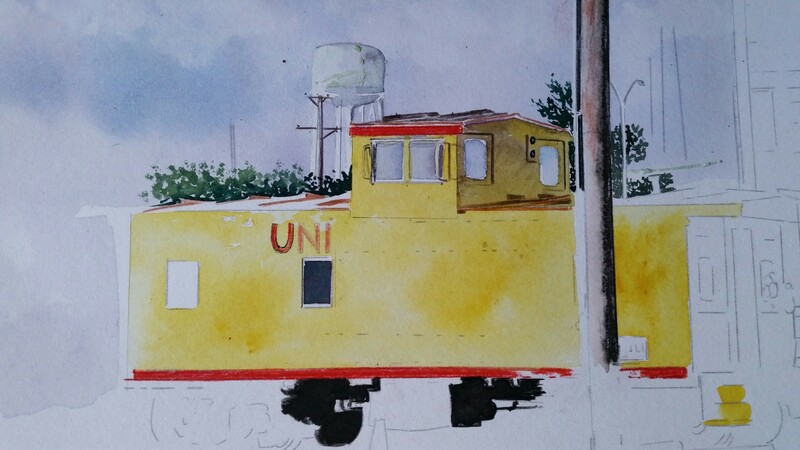 It’s been awhile since I’ve sketched or painted railroad subjects. Here is a Union Pacific caboose I photographed a few years ago in the historic Handley neighborhood of east Fort Worth. I have a railroad series in mind that was inspired by some things I’ve read recently from Proust concerning the series paintings of Claude Monet. We’ll see how it all shakes out. Arlington, Texas looked pretty good in my rearview mirror July 3 as I traveled to Athens, Texas to spend a couple of delicious days with dear friends. 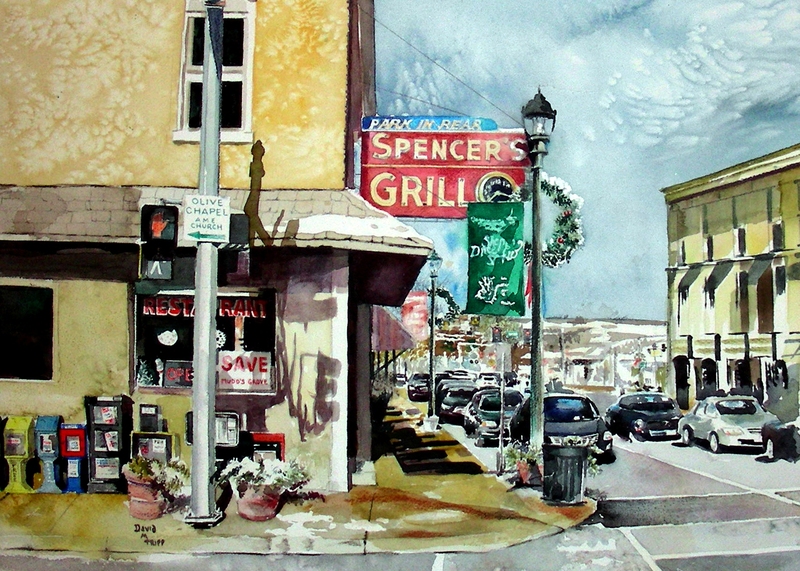 Now that I’m back, I thought I would go ahead and put my latest watercolor sketch on the blog. This was in its finishing-up stages when I left town, but I took it along, worked on it a little outside a local Starbuck’s, then got it out again late yesterday afternoon at my friends’ house and nearly finished it before the fireworks broke out last night. Once I got it home this morning, and took a look at it, I realized I only had about two minutes’ worth of detailing left to do. Now it has everything except my signature. I was amazed to find this door intact in Archer City last weekend. It is part of an abandoned filling station just off the town square, near the Spur Hotel. I had completely forgotten about Viceroy cigarettes–advertisements that were ubiquitous in the days of my childhood. Just seeing the ad on the door filled me with Proustian sentiments. I found it challenging, reprducing the colors of the dirty, reflective glass where the sign had been torn away. 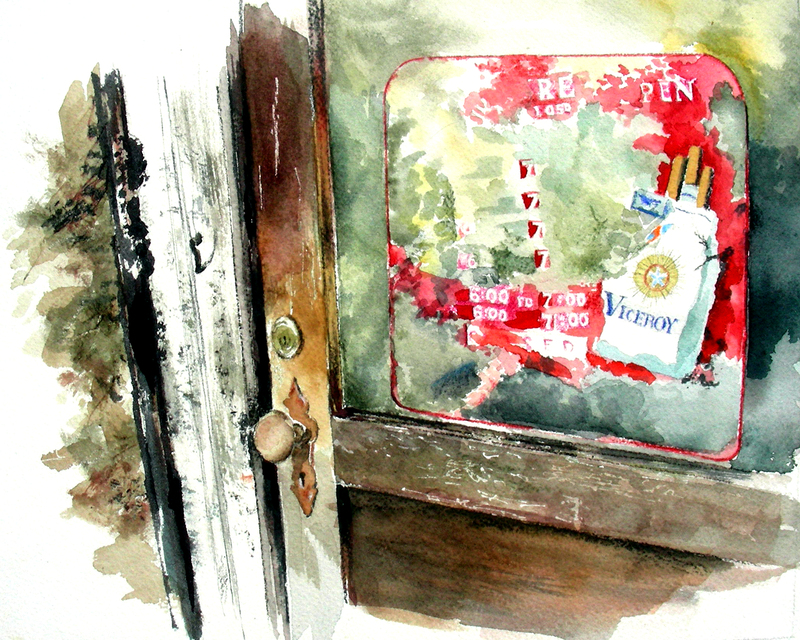 The longer I peered at it, the more I noticed–store hours posted, open and closed notices, details on the cigarette package–and the longer I looked at it, the more I liked what I saw. Of course, I still get excited at wood grains and distress marks all over the door jamb. I still want to improve with my drawing skills, so I spent plenty of time lookimng at the textures and trying to reproduce them in graphite as well as watercolor. The X-acto knife came in handy quite a few times as well. I’m getting more and more comfortable with my tool box of watercolor and drawing supplies. Robert Henri has probably gone further than any other teacher I’ve known, in convincing me to let technique support my objective rather than going stir-crazy with watercolor “tricks.” I still have so much to learn. But I feel that I have learned plenty from this piece. And now it is time to look for something else. I journal because I feel that I am alone. I thought it appropriate to open Daylight Saving time with these immortal words, remembering how I shivered the morning I listened to May Angelou deliver this poem. My body clock, of course, is not adjusted to this. Retiring to bed around 2:00 this morning, I awoke without an alarm at 7:58, feeling that it was actually 6:58, but got up anyway. The Man Cave is chilly, requiring a heavy sweater and plenty of coffee, but I like the lighting now, and I am immersed in Winslow Homer watercolors of fishing subjects. He was an avid fly fisherman and I love his watercolor renderings. I have decided to pursue some fishing compositions, and have gotten some encouragement from a friend on this. This morning, I am using two of Homer’s watercolors as a reference, still trying to find my own sense of vision and composition (yesterday I quoted Proust, speaking of one who wrote with a “watercolor touch”. I’m seeking a watercolor touch in painting as well as writing, still). I am looking at two Homer compositions, one of a boy whittling, and I’ve chosen to put a cane pole in his hand instead. The other is a young boy and girl standing in the sunlight, fishing. Hopefully, I’ll have enough completed on this pair of 8 x 10″ sketches to post for any of you interested in looking. He felt he had left everything behind, the need for thinking, the need to write, other needs. It was all back of him. There have been several moments like that in my own personal odyssey. I take comfort in reading these thoughts from another’s hand. I have always believed that Henry David Thoreau moved to Walden Pond to clear out all the cobwebs and debris in the duct work of his consciousness–a Harvard degree that did not translate into a job, a school teacher stint that didn’t work out, whispers about his accident in the woods that burned off 300 acres of prime Massachusetts forest, and the general sentiment of those around him that he was an idler. I am convinced that moving to Walden Pond allowed him to flush out all that negative debris so that epiphany could take place. I read those same sentiments into the mindset of Nick Adams as he backpacks along the road, leaving the remnants of a burned-out town behind him, heading to the river. He is moving toward epiphany. It has been a few years since I read the texts of two of my treasured volumes on Winslow Homer: Watercolors by Winslow Homer: the Color of Light and Winslow Homer: Artist and Angler. I took them off the shelf this morning, and have spent this entire first part of the day immersed in them, along with Hemingway and Angelou (oh, and also the voice of Garrison Keillor on cassette–a real American treasure with wonderful homespun stories!). I guess that’s about all for now. The Man Cave is providing nice support for what I’m trying to do. More later, I hope. Ernest Hemingway could not write about Michigan until he was in Paris, and could not write about Paris until he had returned to the United States. On this first day of the New Year, I am returning to my ninth grade in House Springs Missouri, at Northwest High School. In Proustlike fashion, this still life with the kerosene lantern is transporting me back to my Art I class, period 1, when we walked into class and saw a collection of at least fifteen objects assembled in the middle of the classroom, and the table arranged in a circle about the perimeter. Each of us was given a full-size sheet of newsprint paper (perhaps 18 x 24″), a charcoal pencil, a blending stump and a kneaded eraser. Immediately, a girl protested: “Mr. Scucchi, I cannot fit all that on this paper!” Coolly, the teacher replied: “Did you ever draw a house?” Discussion over. Time to draw. At college there was an ancient Greek vase on the table in the seminar room where our class in Greek was held. Fresh from Michigan, I had never seen anything before with lines so simple and yet so beautiful, and I marveled at it day after day. In those hours of a student’s trancelike wonder there was born the resolve, unconscious at first, to go to Greece. The Art I students would sit before this giant still life for three weeks, fifteen instructional periods. And in those periods, I became lost in wonder at the kerosene lantern, the focal point (for me) to this immense pile of objects that included a jug, a Ruffino wine bottle with straw bottom, corn scoop, football helmet, antique water pump, bricks and drapery. With charcoal pencil and blending stump, I became absorbed with the textures of the kerosene lantern, the complications of a smoky globe with highlights and scratches and thin wires wound about it, the rusted and pitted armature catching highlights and absorbing shadows, the thinness of the bail that arced above the lantern, and the issues of rendering this delicate piece of iron with charcoal as it presented itself as a string of highlights, mid-tones and shadows. I realize now that, as a ninth-grader, I was not as dull as I and my peers had regarded me. It is a certainty that I was not academically astute or interested, but during those days I realized that I was visually alert and interested in these objects. 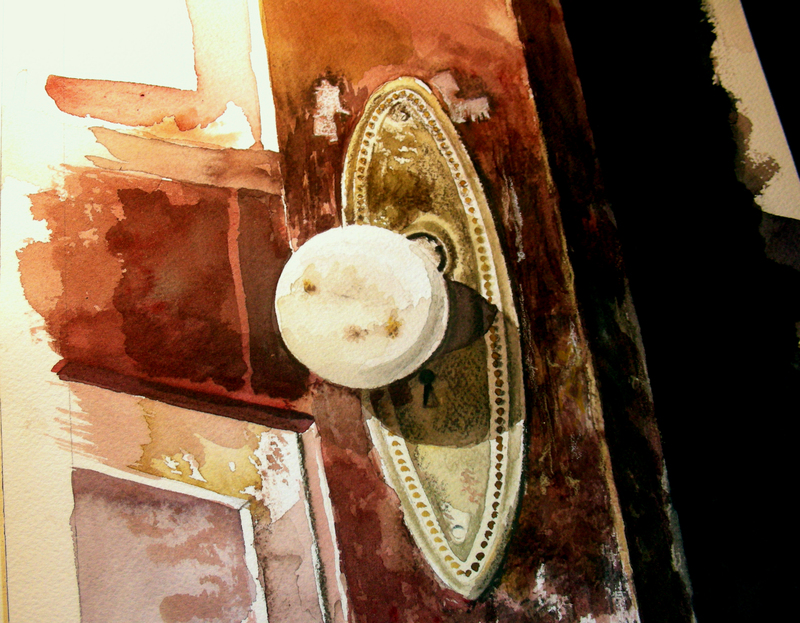 With daylight saving time providing much longer nights, I found myself desiring to withdraw to the man cave this evening and begin my third watercolor attempt of a porcelain doorknob from my collection. About ten years ago, I began collecting old doors to hinge together and use as temporary walls for displaying my watercolors in art festival booths. Because the doorknobs and lock plates interfered with folding the doors together and transporting them, I removed them all, stored them in my classroom locking cabinet and forgot about them until recently. Now I’ve gone on this still life watercolor binge, inspired by a recent visit to the Wyeth exhibit at the Tyler Museum of Art. For several decades, I have pored over images of Andrew Wyeth drybrush renderings of dilapidated doors and knobs, and have stared at real ones as well. In a Proustian sense, they take me back to my grandmother’s ramshackle house that featured abused doors and porcelain knobs with skeleton key locks. I always found them more fascinating throughout my childhood than the doors of our suburban home–brass knobs with all the doors featuring the same wooden stain. As I worked in the studio this evening, I continually replayed the Voices and Visions VHS tape of William Carlos Williams, a family doctor who drove around his small New Jersey town in the 1930’s, taking in images all day, recording them on prescription pads and converting them to poems every evening, late. Imagism emerged in his works, along with those of T. S. Eliot and Ezra Pound. “Say it again–no ideas but in things.” Several months ago, I made a couple stabs at painting still life objects in a prosaic, commercial fashion, much as Andy Warhol did with his Campbell Soup cans and Coca-Cola bottles. I have pulled them out recently, wondering if I should put the images on an old wooden table, or in front of one of my ten vintage doors resting in the man cave. I’m fascinated with these images of late, staring at them, watercoloring and sketching them, reading William Carlos Williams poems and continually looking at Andrew Wyeth and Andy Warhol paintings of prosaic objects. I am not sure where this is going to lead, but I must say I am gleaning much satisfaction, personally, from these experiments.